In the last decades of the 19th century, a movement supporting the return of the Jews from the Diaspora to Eretz Israel grew in popularity in Jewish circles. Modern Zionism had its origins in Russia, in the so-called Pale of Settlement, a region in imperial Russia where Jews had been forced to settle. In this region a series of attacks (pogroms) on Jews erupted in 1881, tolerated if not inspired by the Russian government as a means to divert discontentment of the Russian peasantry from the administration. The pogroms resulted in the departure of no less than 1.5 million Russian Jews, who in great majority migrated to the United States. But small groups of younger Jews, mostly students, set their sights on settlement in Palestine. They found inspiration in a book by their fellow Jew Y.L. Pinsker, whose Selbstemanzipation (Auto-Emancipation), published in 1881, inspired the idea of the restoration of Eretz Israel. They founded a number of agricultural settlements with the financial support from Jewish philanthropists in Western Europe, among whom the French banker Edmond de Rothschild. In the 1890s, the Austrian Jewish journalist Theodor Herzl published Der Judenstaat (The Jewish State), in which he developed a political ideology of Zionism. Herzl was also the driving force behind the First Zionist Congress, held in Basel, Switzerland, which saw the birth of the World Zionist Organization (WZO). In 1903, the WZO decided to strive for a Jewish homeland in Palestine. The organization supported small-scale settlement in Palestine and at the same time focused on organizing a worldwide Zionist movement. Between 1900 and 1918, the number of Jewish settlements in Palestine rose from 19 to 47. The population of Palestine at the time was about 700,000, of whom just over 10 percent was Jewish. After Herzl’s early death in 1904, a Russian Jewish emigré in London, Chaim Weizmann, became the highly influential leader and ideologue of the WZO. In August 1914, World War I broke out in Europe between the Central Powers (Germany, the Austro-Hungarian Dual Monarchy and the Ottoman Empire) and the Triple Entente or the Allies (Great Britain, France and Russia). The participation of the Ottomans, decided by Constantinople at a very late moment (November 1914), turned the Greater Syria region (Bilad al-Sham) into a theatre of war. The region suffered enormously, not only from the destruction caused by the actual fighting, but also from famine and epidemics that decimated the population in some parts of Palestine, and from the harsh measures taken by the Ottomans against Palestinians who were suspected to be Arab nationalists. Three major battles took place on the line Gaza-Beersheba. In the third battle, at the beginning of November 1917, British and Australian forces succeeded in breaking through the Ottoman defensive lines near Beersheba. 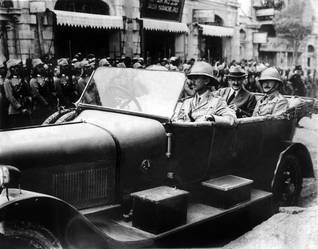 One month later, the British commander General Sir Edmund Allenby made his entry into Jerusalem. In the following year the rest of Palestine was captured by the Allies, and the British set up a military administration for the region.